In Malaika you play as a prehistoric princess on a quest to eliminate an alien threat. Without Will Smith or Tommy Lee Jones to call on, Malaika journeys out into the world and proceeds to put bone to head. But hey, a story in an arcade game is like the story of an 'adult' movie - a simple binding of events to justify the outcome. That's it. If you are here to enjoy a tale of a single empowered female heroine as she experiences the trials and tribulations of single-handedly fighting off an alien invasion, you'd be better off with elsewhere. If however you fancy a nice little bit of arcade action, Malaika will oblige. Unlike the rather dismal prequel 'Malaika - Prehistoric Quest' (reviewed back in RGCD issue #03), in her latest outing the gameplay takes place on a single screen filled with platforms populated by aliens walking back and forth (and occasionally ascending upwards). The enemies are not the smartest bunch and don't seem interested in pursuing the player. She in turn navigates the platforms whilst bashing the aliens over the head with a bone, leaving them dazed so she can then kick them in the space-nads (at which point they turn into sweets). If this isn't the next blockbuster videogame movie adaptation I will be heartbroken. Right enough dicking around, is it any good? 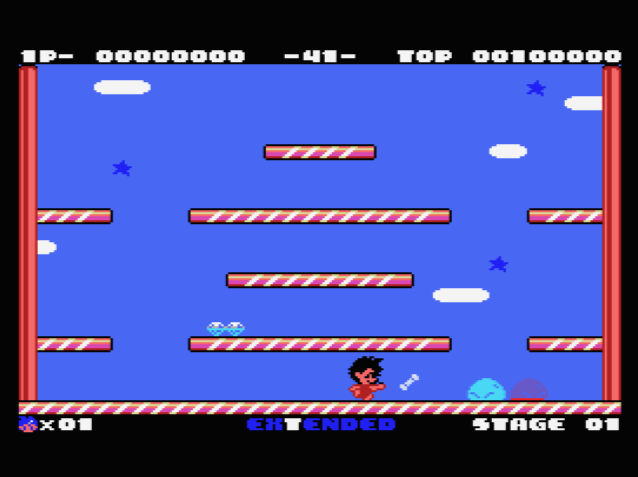 Yes, its a lovely little arcade game and if I had played it on a real coin-op in my youth I certainly would have fond memories. Its a very playable game, and later on it does start to challenge you so don't be put off by the initial difficulty as things eventually become very tricky. The controls are responsive and intuitive, although I would recommend the use of a two-button joystick in order to really appreciate its arcade heritage. 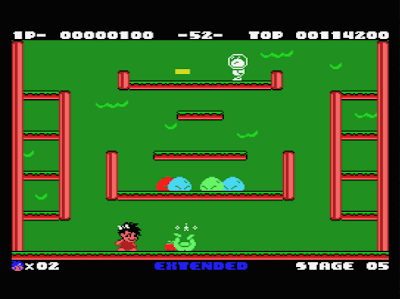 Graphically it's really good for an MSX game, with clever use of the limited palette giving a fresh visual style. Although the sprites are pretty basic, the main character is a particular highlight, with lovely little details like the animation of Malaika pulling the bone from her hair. The aliens I felt were a little uninspired, but who cares right? You're only going to kick them in the spaceballs after all. The music is suitably upbeat and enjoyable, you won't hear tunes quite as catchy as the game it was based on but they are a welcome experience nonetheless. Sound work is solid and is in keeping with the games comical nature. So what's my conclusion? 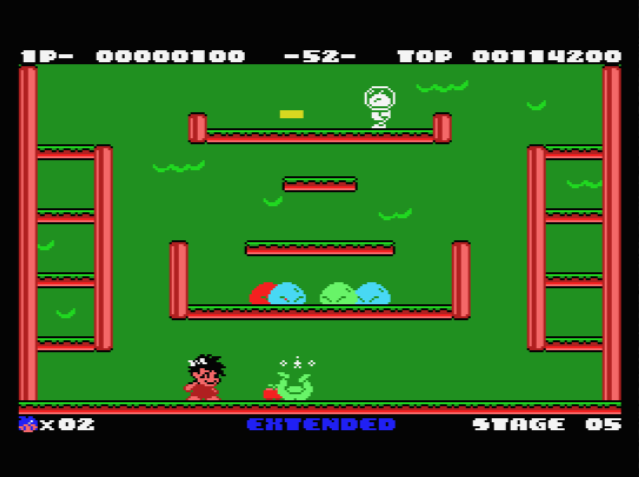 Let us address the elephant in the room; Malaika is not as good as Bubble Bobble, however in some bizarro universe, this could of happily stood by its own merits in the arcades of the 1980's. For fans of the Bubble Bobble series, go in with an open mind and I think you'll enjoy it. Download the game here (from the developer's website). Run it using blueMSX (freeware). El juego está muy bien, pero cualquiera de los cuatro primeros clasificados en la competición podía ganar por calidad.